This week the Horror Duo cover a pair of family films, as we get ever closer to Christmas. 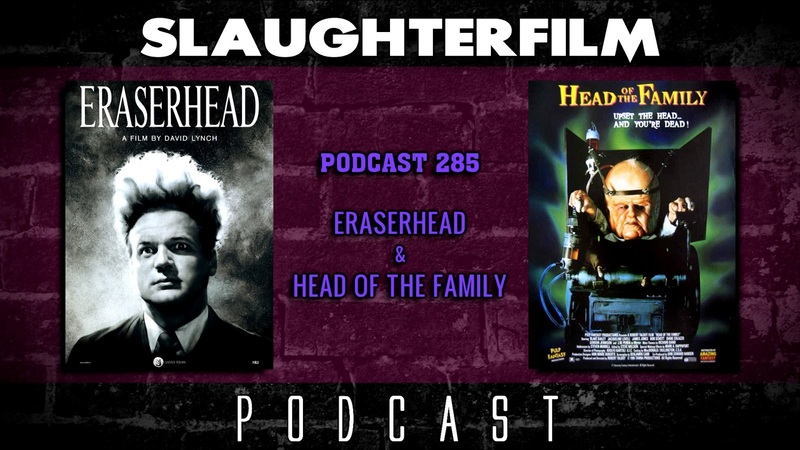 Forest unites the art house with the grindhouse by sharing his thoughts on the iconic cult film by director David Lynch, Eraserhead. Cory takes the low road with a surprisingly entertaining sci-fi noir film from Charles Band's Full Moon Entertainment, Head of the Family. Forest & Cory also chat about donating to Toys for Tots (and so should you! ), Hank Azaria hints at the disappearance of the Apu character from The Simpsons, and what is to come of Tarantino's planned ninth film. CORRECTION: Cory mistakenly says Cyborg 3, but he really means the film Class of 1999 2: The Substitute starring Sasha Mitchell. For more Slaughter Film news and reviews, as well as show notes and special events, make sure to visit our website; SlaughterFilm.com. 44:58 - "Head of the Family"